Every branch of study has its special terminology, and theosophy is no exception. Originally published in London in 1933, this Glossary defines some 300 terms most frequently found in the field of metaphysics and explains them in the light of theosophy. 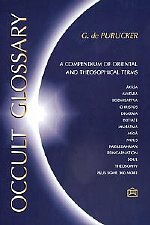 An invaluable textbook for the student, the Occult Glossary is a succinct and reliable aid in discerning the occult or "hidden" meaning of many Sanskrit, Greek, and technical terms used in theosophical literature.